I reviewed Module XL1 Quest for the Heartstone recently and among other things it had the stats for a character I knew very little about. 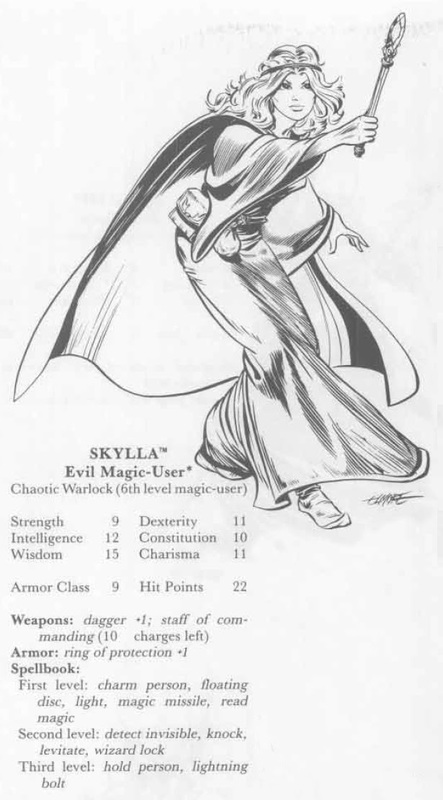 Skylla was an evil magic-user for the LJN/AD&D toy figure line. She never made it to the larger "Action figure" as far as I can tell, but instead was one of the smaller "collectible" figures, abut 2" tall. 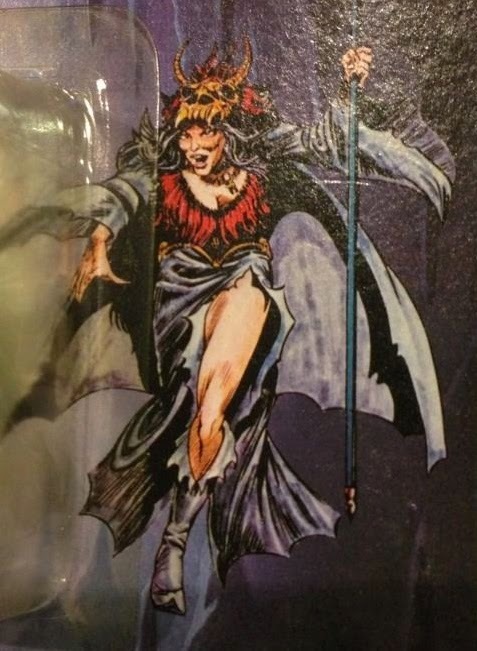 She comes up every so often on eBay, and she never appeared in the D&D cartoon to my knowledge. "while wizards are the most powerful of magic users, the female must be considered even more special. In a world where every hand is turned against her she has risen in a field that is difficult indeed. Able to cast magical spells of awesome power, she will go to any lengths to win her private battles. Often this type of person can be counted on to use magical devices of great power. Glowing slaves. Rings, and amulets are constantly found in the possession of such a person much to the horror of her enemies." While I want to say I never saw her before and I honestly don't remember the character, there are some similarities with this character and a witch I made around the same time. I pulled up her stats from Quest of the Heartstone. Yeah. That is Larry Elmore doing the Skylla art. A couple other things jump out at me. She is 6th level so her "name level" is "Warlock", or in old D&D Expert, a "Witch". Plus the Italian version of the character refers to her as "La Strega" which also means, the witch. She also appeared in The Shady Dragon Inn supplement. Spells: 1st Level: light, magic missile. 2nd Level: detect invisible, levitate. 3rd Level: hold person, lightning bolt. +1, staff of commanding (10 charges). SKYLLA™ Evil Magic-User has silvery dark hair, stands 5'10", weighs 131 lbs., and has flashing dark eyes. She favors gray clothing, although she always wears her golden demon headress and her golden demon girdle. SKYLLA carries a magical staff, a staff of commanding. Once she was a student of RINGLERUN's, but when she was exposed to the Heartstone, she began to seek out the evil, harmful side of magic. Her lust for power grew until she broke away from the good magician, seeking personal gain and power. Because the Heartstone did not affect RINGLERUN, she has grown to hate him for what she feels is his "soft and stupid" use of magic. Her stats are quite similar to a witch character I had been using (and still use) at the time. Also her concept, a magic-user that uses a lot of magic items, is not unique (there was one in the Myth Adventures books) was also something I had done for my witch. This is all a rather fortunate find for me really! I needed a new adversary to work with that had a history with one of my witch characters. I was going to go with Iggwilv, but she is way too big. Skylla here is perfect. 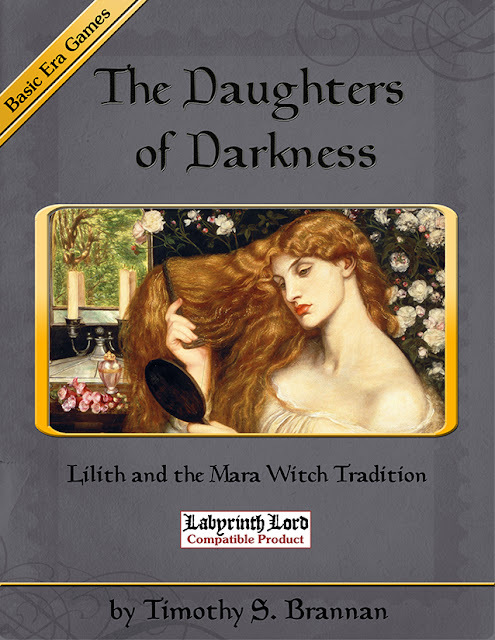 Also, I wanted a witch character I could use to compare the various witch books I have. I wanted someone around 6-7th level. I needed someone with "normal" stats and someone that would not take me hours to stat up. I was going to go with my own witch character (again), but none of you have the connection to her that I do. So the reading might be a little dull. Skylla is perfect for all of this. I can develop the character as I stat her up to compare systems. Win all around. Besides. Playing around with a chaotic evil witch will be fun. 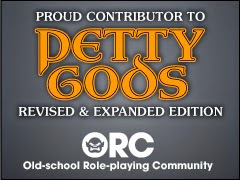 I plan on using her (in some way) in my kids 1st Ed game this weekend. They are still working through the Cave of Chaos. In the meantime I'll also keep looking for more information on her. Oddly enough, a few months ago I did some Internet research about Skylla. One interesting finding is that the "Good Enchantress" you found isn't Skylla -- it's actually a character named Charmay (who appeared in some of the coloring books); if you do some more research, you'll find more pix of her. I'm not sure how/why the 2 images got swapped for many of the TSR promodcts, but if you re-read Skylla's description from "The Shady Dragon Inn," you'll realize that Charmay looks nothing like her... but the image from that collectible does! Yeah. 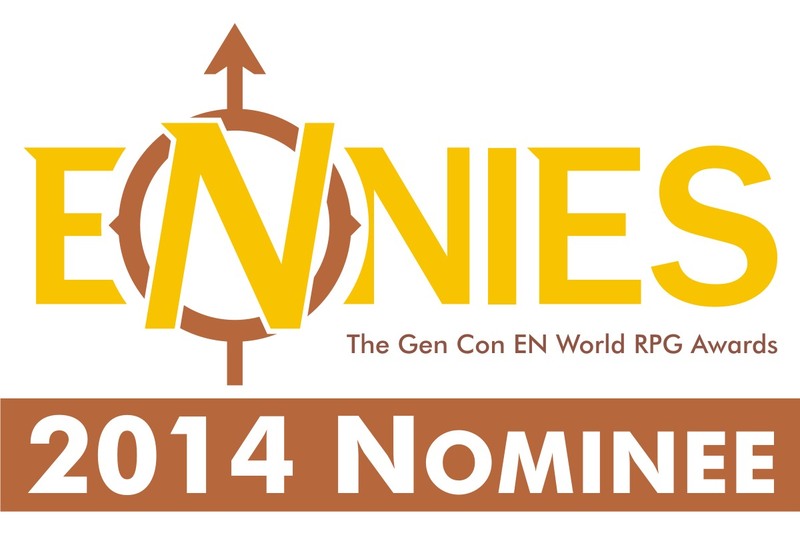 If you go to Elmore's site that image is a NG Enchantress character.